This is a really nice, cheerful day so come along to see what happens even if you can’t help out. I’ve attached a poster advertising the event. Please print and distribute if you can. 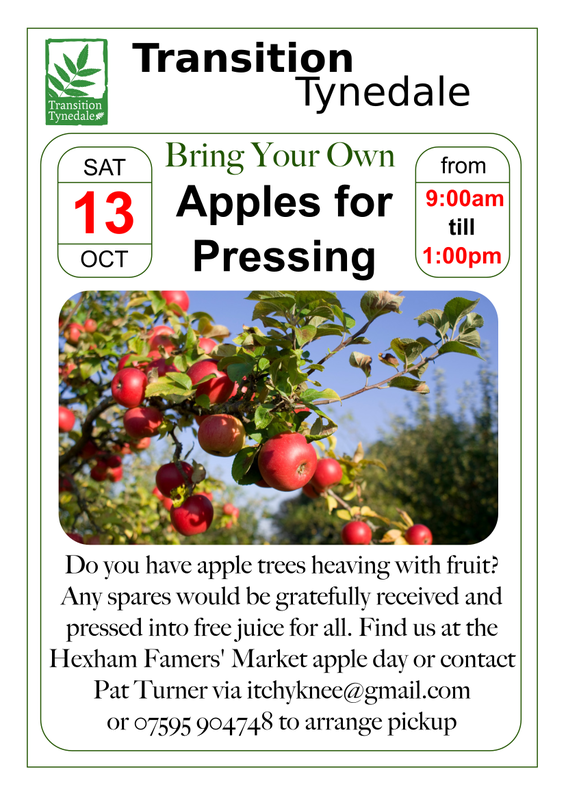 Please ask local friends, colleagues and family to bring their unwanted apples to the apple themed Farmers’ Market In return they will receive bottled apple juice made on the day. We would be very grateful if you could start collecting clean, glass and plastic bottles to put the delicious apple juice in for helpers, donors and to give away for donations to a charity. Plastic milk bottles are great for freezing juice. Bring them on the day. If you’re able to help, please email info@transitiontynedale.org with the time slots you’re able to be there. Just half an hour will be a great help. Picnic and community picking session. The field is on the left hand side of Shaws Lane about half way up. You will see a silver Skoda parked up and a big notice on the fence. Please come along if you can, and bring something for yourself to eat and drink. It’s always a really nice afternoon 🙂 Children are welcome. If you have a cycling helmet bring that too….it prevents bruises from falling apples! The apples we collect get used at the apple pressing event on the 13th of October, and of course you could take some home. Mr Carr has been very kind in the past about allowing us on his land to pick the apples from his trees but he gets upset about the amount of dog poo he has found as he grazes cows there sometimes and they get ill – so no dogs please. Why do we need cob and other sustainable building methods now? What areas within the school curriculum overlap with sustainable building methods? How will working with cob as a school project benefit the children?